Kiln furniture usually refers to different posts and shelves that are used to support glass during the glass fusing process. The furniture is generally made from compressed clay called mullite. Being very durable and strong, mullite is able to resist kiln temperatures and can be used repeatedly. It is used for shelves, posts and dams. Kiln shelves are generally flat and made to fit inside the kiln with a gap between the shelf and the kiln sides. Shelves usually sit on posts or blocks on the kiln floor. Like most kiln ware, shelves will vary in size and weight. Posts come in different sizes and are used to raise shelves and molds above the kiln floor, which allows for ventilation below the shelf or mold, promoting a more even temperature flow. Dams are varying sized strips of mullite placed around glass to hold it in place and to maintain a certain thickness of the glass during the fusing process. Dam strips are also used to produce pattern bars, which are then sliced on a saw and used in other glass fusing projects. Apart from being used for kiln repair, kiln bricks of different sizes are used to support items as well as holding dams and other objects in place. 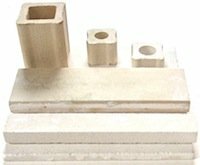 Another material that can be used for kiln fusing is ceramic fiberboard, which is able to withstand high firing temperatures, and is extremely lightweight. It comes in different grades of toughness, but it is subject to scratches and dents, it can break from the weight of the glass pieces placed on top of it during the fusing process. It needs to be very well supported unless you are fusing light items. Fiberboard can also be used as a slumping mold. To ensure a long life, shelves and posts should be dry before use and not fired at extreme rates. Wet molds should not be placed on a shelf as the shelf may split. The furniture should always be coated with kiln wash to prevent glass sticking to it.